It’s the American pastime. It’s the game where a comeback is always possible. The game that draws you in and keeps you there; whether it’s the relief of when the pitcher strikes out a batter, the satisfaction of the crack of bat against ball, or the excitement of the home runs and the goofy mascots… Oh and don’t forget the outrageous ballpark hot dogs. Well now is your chance to experience all that and more – right in our backyard. For the first time ever, the Australian Baseball League’s first expansion team – branded as ‘Geelong-Korea’ will be based in Geelong for the upcoming ABL season. As a passionate sporting city (go Cats! ), we are pretty excited to welcome international baseballers from Korea who will base themselves in Geelong, playing their home games at the Geelong Baseball Centre. Over the next few months, Geelong-Korea will alongside the Adelaide Bite, the Melbourne Aces and the Perth Heat in the 2018/19 ABL’s Southwest Division which will also be broadcast to millions of baseball viewers all over the world, enabling Geelong to have a truly global audience. The games themselves will be held on Thursday, Friday and Saturday from 7pm, and on Sundays at 1pm, giving sports fans plenty of opportunities to support the team and see what this American pastime is all about. It gets better though. As the first ever Geelong baseball franchise, it will be providing the community with an unparalleled and unique entertainment experience including 25-inch hot dogs, nacho loaded baseball helmets, cheerleaders, live DJs, mascots, and T-shirt guns shooting giveaways into the crowd. Oh and they’ve even teamed up with Two Birds Brewing for their ‘Golden Tickets’ which gets you general admission plus two birds beers at the game of your choice. 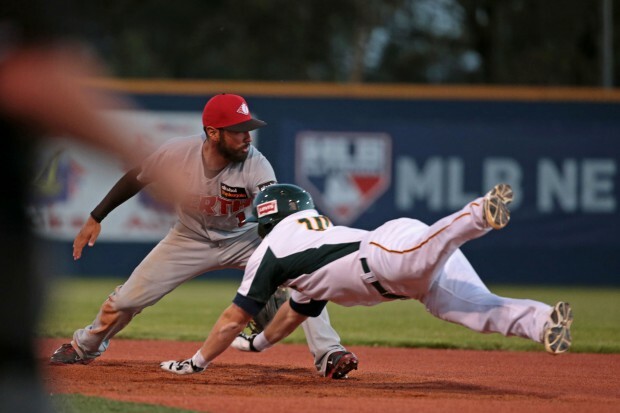 As an added bonus to all that, just basing a team in a grassroots focused area such as Geelong is an enormous opportunity for the elite side of the Australian game to work closely with the next generation of ABL stars. It’s a win win for everyone. Memberships are now on sale and tickets can be purchased for individual games. There’s also free general admission areas on the lawn around the field for each game. Check out the games coming up below, gather a crew and let’s support Geelong’s latest national based team this summer! Visit GeelongKorea.com.au for all the details and ticketing info.